This DVD introduces real people with ordinary lives; they work hard, love their families, celebrate successes, and endure failure. Through it all they grow closer to God without leaving the circumstances of their daily lives. They have found happiness living the spirituality of St. Josemaria Escriva, whom Pope John Paul II called "the saint of ordinary life." "[St. Josemaria] was open to all. He loved the world passionately, since it was created by God. Every human reality attracted him. He read the newspapers, he watched the television news, he liked love songs, he prayed for the astronauts who went to the moon—he was very affable. He knew how to instill confidence and be welcoming to others." 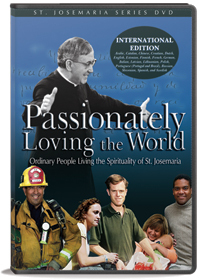 For more information about this DVD or the St. Josemaria Institute, visit its website.